As a plaintiff’s personal injury trial lawyer in Atlanta, Georgia, I often check Georgia statistics regarding the number of car wrecks, bicyclists wrecks and pedestrian accidents, including fatalities. I noticed that Richmond County, Georgia has initiated a new program that targets jaywalking pedestrians or pedestrians caught not using crosswalks to educate them about the rules of the road for pedestrians and why they are so important to follow. So far this year, the Richmond County Sheriff’s Office has reported nine traffic fatalities. Four of the incidents involved pedestrian-versus-vehicle collisions. In 2013, police responded to 26 fatal traffic accidents, eight of which involved pedestrians. Earlier this month, three teens and an Augusta man were struck by vehicles on Richmond County roads. The man and two of the teens died as a result of their injuries. The third teen remains hospitalized. Unfortunately, Georgia and South Carolina, rank among the worst in the country for pedestrian and cycling fatality rates. And many of these incidents are hit-and-run crashes, where the at-fault driver hits a pedestrian and can easily make a quick get-away as his victim lies helpless and injured on the pavement. I have such a case pending right now in which the current issue is the filing of an uninsured motorist claim against the plaintiff’s own insurance carrier, State Farm Insurance Company, as they have denied coverage in every way possible under the sun. I blogged about this case awhile back and about the fact that when you are on foot and hit by a car as a pedestrian, you have an uninsured motorist claim against your own car insurance. Few people know this and most policies do everything they can to hide the fact that you have such a claim. 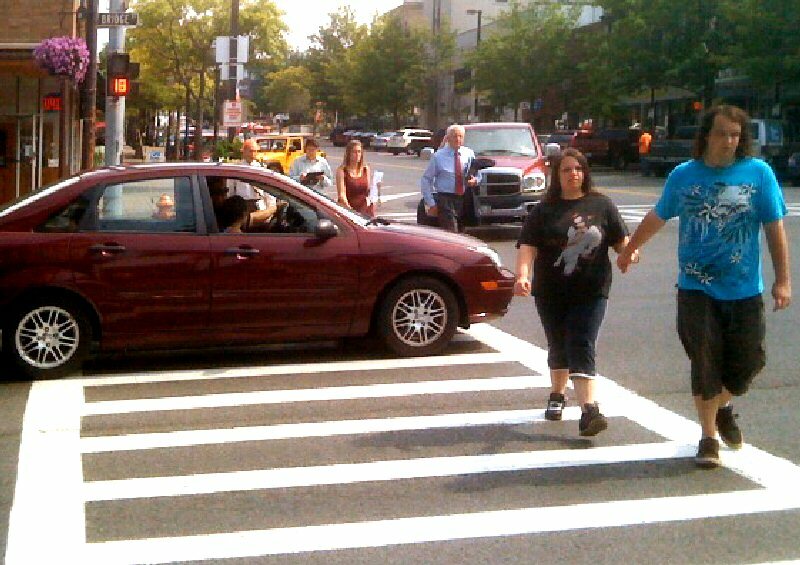 The Georgia Law is that cars must stop for pedestrians in a cross walk and must stay stopped. Cars may not drive around the pedestrians or try to squeeze by them. If the pedestrian is approaching and is within one lane of the car the car must stop. My own observations lead me to believe very few Georgia drivers know this rule. I live near Emory University where hundreds of people walk to and from campus and class and to and from Emory Village. As a cautious driver I must always be on the lookout for pedestrians. With so many car drivers constantly checking their cellphones now or texting while driving, the problem of hitting pedestrians has increased in Georgia. Absent-minded car drivers mean more pedestrian injuries. The Georgia Department of Driver Services has a helpful handbook online entitled “What Georgia Drivers Must Know about Pedestrians” to refresh your recollection about the Rules of the Road in Georgia as they relate to pedestrians. Of course, we must acknowledge that sometimes there may be some contributory negligence on the part of the pedestrian that either causes or contributes to the pedestrian being hit by a car. There is no question that many Atlanta pedestrians walk out into a street completely oblivious to car traffic, because the pedestrian himself is texting while walking, or deeply engaged in a telephone call or zoning out to the music in his ears that he is listening to using earphones that cancel out other noise, such as a car’s horn beeping a warning. Pedestrians do need to be more aware as they walk on sidewalks or use crosswalks. Pedestrians have to exercise reasonable care for their own safety. But in the end, I think it comes down to the driver of the car who needs to pay more attention and be more alert. Studies consistently show Georgia drivers to be some of our country’s worst. In the study completed by CarInsuranceComparison.com, the Peach State landed its ranking in the bottom-third of the nation based on statistics such as fatality rates, failure to obey traffic signals and seat belt laws, drunk driving, tickets and incidents of careless driving provided by the National Highway Traffic Safety Administration, National Motorists Association and Mothers Against Drunk Driving. Both car drivers and pedestrians need to do their fair share in keeping Georgia Roads safe.